For many astronomers, we spend 80% of every work day parked in front of a computer screen. We code, we write, we make plots, we think, we read… all from our desk chairs. Over the last two years, I’ve found a handful of software that helps me productive and happy at my screen. I probably don’t need to tell you what Dropbox is. You can store papers, plots, posters, pictures of kittens in an online repository that syncs with a folder on your computer. My advisor and I have a shared folder, which comes in handy for updating drafts, collaborating on code, or sharing a new result. 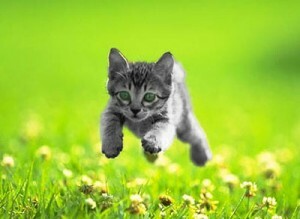 Make sure you get the iPhone/iPad/Android app too, and access your kitten pictures from anywhere. 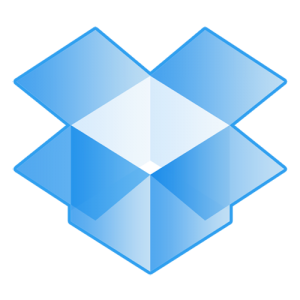 Dropbox is run by MIT grads so watch out for awesome events like Dropquest 2012, a puzzle-hunt based on MIT’s Mystery Hunt. Cost: Free for 2GB (up to 18 GB if you find all the fancy ways to get free space!) Pay $99/year for 100 GB, $499/year for 500 GB. Download the iPhone/iPad/Android app too. I took pictures of posters and talks during my last conference and they uploaded straight into my research notebook! Cost: Free for up to 60 MB a month of uploads and downloads. $45/year for up to 1GB/month. There are a ton of text editors out there and you probably have your favorite (emacs? vim?). TextMate is just my favorite. It has syntax highlighting for almost all possible languages, tabbed-editing within a project, vertical highlighting, and is navigable by the normal commands you’re used to (so that you don’t have to play Vim Adventures). Cost: $50 for a license, which lasts forever on your machine. Relatively steep learning curve (so. many. 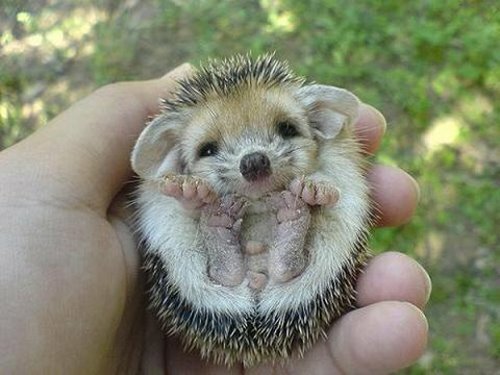 buttons) but very powerful. There are tons of tutorials out there to make it easier (for example, this one). Great for making posters and editing plots after making them in your coding language of choice. Cost: Your university might have a license for free or steeply discounted price, and it’s often installed in school computer/graphic design labs. Otherwise, an alarming $599 for a standard version, $349 for a student/teacher edition (for the full Adobe Creative Suite.) 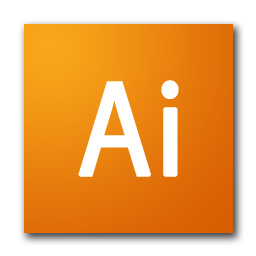 You can actually buy an academic version of Illustrator alone for $99. 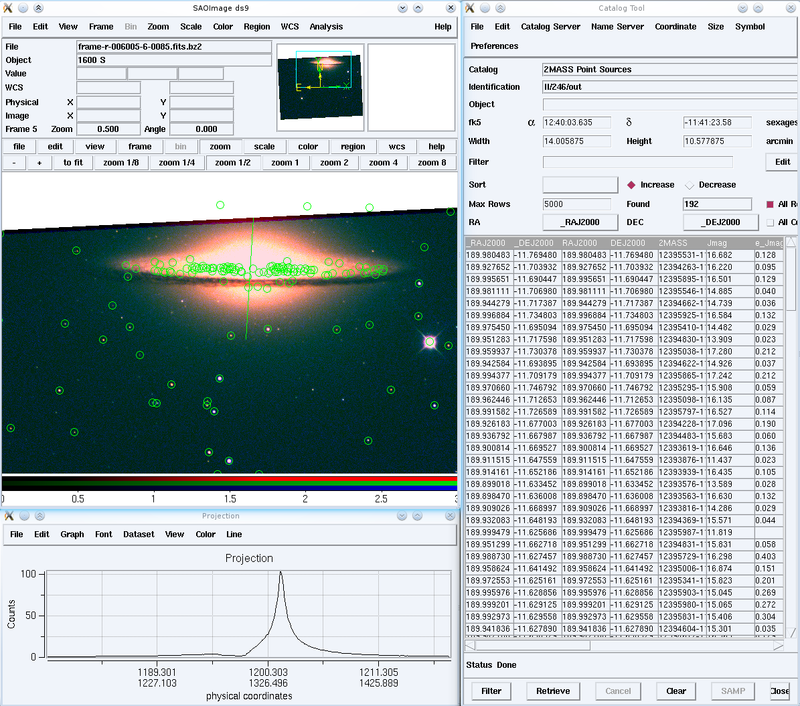 LaTeXiT is a wonderful tiny piece of software. 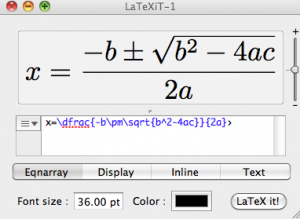 If you need to add an equation to a talk, figure or poster, you just type the LaTeX you want in the little box, press the button, and it makes a little picture of the equation, which you can drag into the right document or export as a pdf, eps, jpeg, or tiff file. I live in a state where there are earthquakes. Even if I backup to a local external hard drive, one bad day in California could destroy both my computer and external drive, and in doing so, two years of blood, sweat, and tears. Perhaps you live in a state with volcanos or hurricanes or tornados, or you just have bad technology luck. You should back up your computer, and you should make sure it’s backed up redundantly (i.e. in multiple places). The so-called “cloud” is a great place. CrashPlan is my choice for backup. It backs up automatically so I don’t need to think about it, and I get unlimited cloud storage for my single computer (which I use for personal and work things). Bear in mind the original backup to the cloud takes weeks, but you can also set it up to backup locally which is orders of magnitude faster. 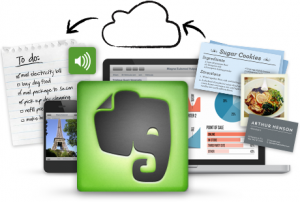 Cost: Local backup is free; unlimited cloud storage is $49.99/year. Another thing that people (engineers) tell you that you should do is use version control software. (I’m taking part of my time this summer to do things I “should” do). Subversion is the traditional version control tool; it’s is open-source and might even come on your computer already. Subversion itself is free, but clients can cost money. Cost: Versions and Cornerstone are both $59. $39 and ~$47 respectively for students. If you like mind-mapping, here are some suggestions. 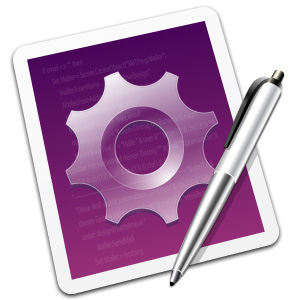 I’ve used MindNode Pro before; it works very nicely. If the kittens aren’t helping you write, there are more suggestions for distraction-free writing tools here and here. Do you have any software you swear by? Have I missed something you find crucial? The best thing I’ve bought in ages is AntiSocial. It turns off the fun parts of the internet for a set amount of time, and I find it invaluable when I just can’t get writing. I tried its companion program – Freedom – too, which turns off the *whole* internet but that’s really a last resort. Antisocial blocks things like Facebook, twitter, and optionally email but still lets you get to the useful things like ADS. 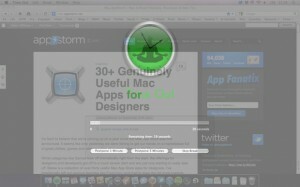 There is a neat app called “jiggler” that moves your mouse every once in a while to make sure your computer does not go to sleep while you’re giving a talk. You could always futz around with your settings, but apps are much more excellent. I haven’t tried Jiggler – but Caffeine sounds like a good alternative. It puts an icon in the taskbar. Click it once and it stops your computer sleeping, click it again it sets everything back to normal. Good for when you’re reading papers too. For me, Mendeley and Zim Wiki are essentials for productivity. For graphics, I prefer pyxplot over gnuplot and nothing comes close to Inkscape for diagrams (not even Illustrator). On a Mac SourceTree (free) is the way to go for a version control GUI–works with git/mercurial, and since git can work with subversion you can access that too. If you are just learning vc, i’d skip subversion in favor of git.